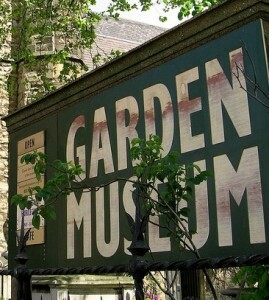 The Museum was set up in 1977 in order to rescue from demolition the abandoned ancient church of St Mary’s which is the burial place of John Tradescant , the first great gardener and plant-hunter in British history. Three exhibitions each year explore the making of British gardens, and a programme of over 30 talks and interviews celebrates heroes and heroines from the forgotten plant-hunters and gardeners of the past to the designers and writers in fashion today. Visitors will also see a permanent display of paintings, tools, ephemera and historic artefacts: a glimpse into the uniquely British love affair with gardens. At its heart is a knot garden designed by the Museum’s President, The Dowager Marchioness of Salisbury (who was then also re-making the gardens at Hatfield House, Hertfordshire). The knot garden and its surrounds are planted with species introduced by the Tradescants – such as the scarlet runner bean, red maple and tulip tree – and many others grown by them in their Lambeth garden.